atelier van lieshout is a multidisciplinary studio that operates internationally in the field of contemporary art, design and architecture. founded by dutch artist joep van lieshout in 1995, the atelier's work varies from sculptures and furniture, bathrooms and mobile home units to complete architectural refurbishments. on the occasion of milan design week 2012, dutch furniture manufacturer lensvelt celebrated 12.5 years of working together with dutch designer / artist atelier van lieshout (AVL). 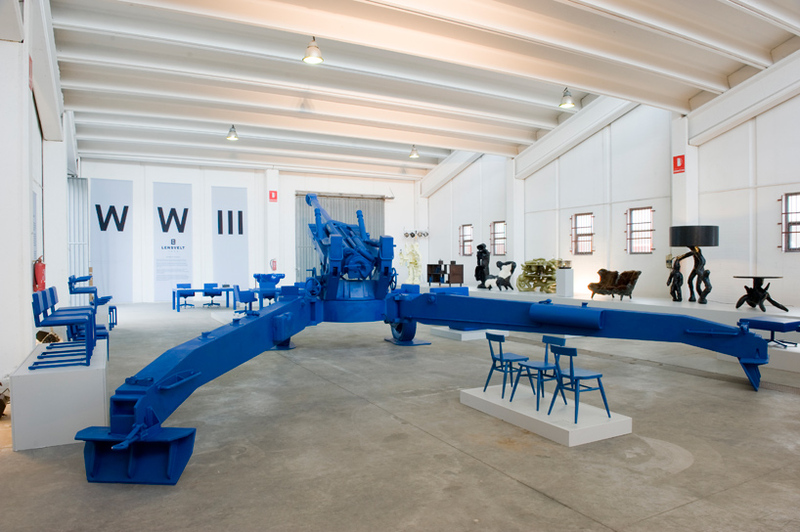 the central focus of the show space was the ‘gigantic blue cannon’ (WWWIII, 2010), which stood as a symbol of the powerful partnership between the two. the industrial object also referenced AVL’s recurring themes of work organization, power structures, revolution and autarky. this exposition presented an overview of the large number of furniture pieces that were developed together between lensvelt and AVL, and was the platform for introducing the newest pieces as a result of their long standing collaboration including: ‘spider’ chair and ‘koker’ chair.